I thought it was time I did some actual mathematics here, and hope to attach it to some of my thoughts on how mathematicians ask questions. I will try to keep the presentation completely elementary, so the only prerequisite is a little interest. This is not intended to be a thorough survey with everything addressed, just a collection of opinions, you have been warned! Keeping with this figure we find that that four copies of this tile make a larger version of the same shape. We can instead subdivide the tile, and this has the advantage of not making things larger and larger, two more subdivisions are shown in the figure. This process gives an interesting result. So where do we go from here? The first thing is to choose a good name. To some mathematicians this is as important as the actual result. So these are tiles that replicate themselves. What can we call them? Rep-tiles of course. The danger of this name is that the joke has already been used by Escher. However I did not come up with it, I believe it was created for these tiles by Golomb, so will let it stand. Creating new names for things happens often and can be very confusing! This raises an interesting question. Three of the rep-tiles above are in a sense the same. They are clearly different shapes, so they should be considered different rep-tiles, but we can change one into another in a simple way. So we can ask, what exactly do we mean by “the same”. This is something that mathematicians do a lot. We take some large set of objects and give some rules as which should be the same, we call them “equivalent”. For example here we say that the picture above contains only two different rep-tiles, not 4. Can you show why the chair rep-tile does not have any equivalent shapes? All the examples shown so far have one tile replaced by four. We therefore call them 4-reptiles. Are other numbers possible? As you can see from the first example, having a 4-reptile is also a 16-reptile (16=4×4) and a 64-reptile (64=4x4x4), by a similar argument all the examples so far are reptiles for any power of 4. Four is a natural number to use as it is the number of tiles we need to create a tile twice as large as the original. That is because we are doubling the lengths in the tile, so the area will increase by four. So let us consider what happens when we triple the lengths of the edges. Here you see the chair tile as a 9-reptile. This obviously show us that it is also an 81-reptile, 729-reptile and so on. We can also combine the two rules to show that it is a 36-reptile as 36 = 4×9. So what other numbers are possible? Is the chair tile an n-reptile for all square numbers (4,9,16,25…)? The answer is yes, showing this does not require any complicated maths, though it does need some clear thinking. I encourage you to try and find at least some examples yourself. Alternatively you can find answers by looking at some of the reference websites I will put at the end. 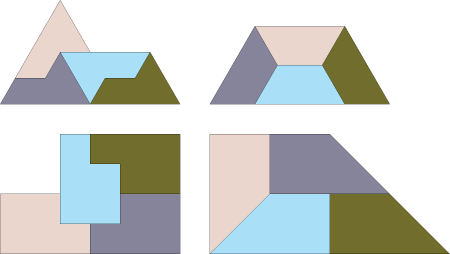 The second image here is related to the 4-reptiles for the square and others shown above. The division repeated twice again gives the same rule as described. Though I say this is a boring example, as the tiling produced can be produced by easier methods, it does one interesting feature. If you live outside the US you might use this shape every day and do so because it is a rep-tile! The A system of paper sizes A0, A1, A2, A3, A4… are based on this shape as two copies of each paper size makes the next size. Thus two sheets of A4 give a sheet of A3, two of A3 give one of A2, and so on. To find more interesting examples of 2-reptiles we have to consider more exotic shapes. Here we start to go beyond the process of finding examples and start to ask the mathematical question of whether we can find every 2-reptile. In fact with some additional conditions, it has been proved that the image below, along with the boring reptiles above give all possible examples! Interesting 2-reptiles, from the top left clockwise: Levy Dragon, Twindragon, Heighway dragon and Tame twindragon. 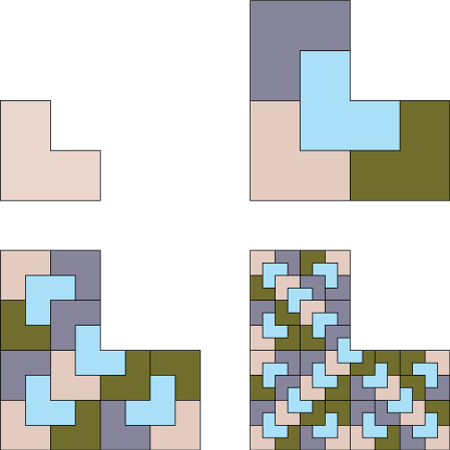 In all the examples above the tiles used in the tiling could be moved to each by translations and a finite number of different rotations. We could therefore consider a finite number of tiles and make the tiling with translations. 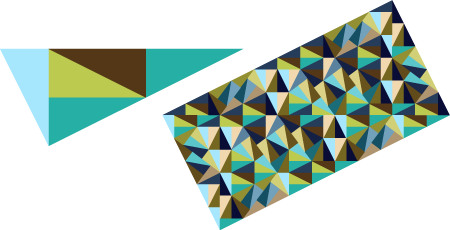 That is not possible in this example, you can get a glimpse of this by looking at the second part of the picture where every tile is coloured by orientation. 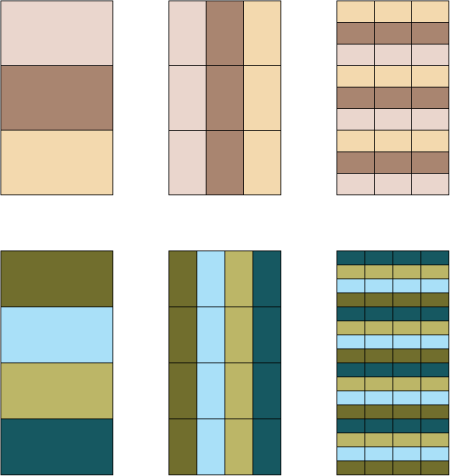 To get from one tile to every other tile in the tiling would require an infinite number of rotations. As the construction is so simple this a quite amazing fact (to me at least!). Construction for n-reptiles, shown for 3 and 4. Can you work out the edge lengths of the shapes? From the construction above can you give n-reptiles for any composite (non-prime) n that generate non-periodic tiling? From the pinwheel construction can you find n-reptiles where n is the sum of two squares? (a construction also mentioned by Alon). Finally a new general question for which I would love an answer. Can you find a general class of n-reptiles with more than 4 edges? The chair tile is both a 4-reptile and a 9-reptile. What other numbers are compatible in this way? For example can a shape be a 2-reptile and a 3-reptile? 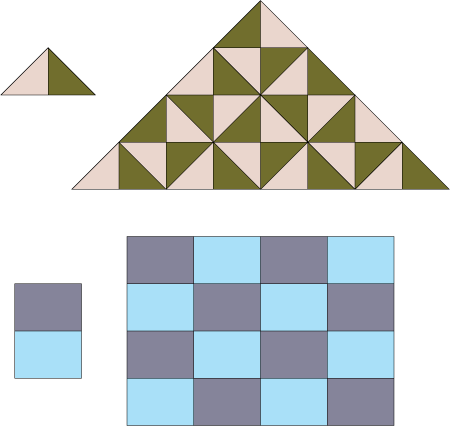 Several of the examples give above are shapes called polyominoes, shapes made by gluing squares together. What polyominoes can be rep-tiles? The big question, can we gain a full understanding of rep-tiles in general? Maybe we can list all possible 2-reptiles and 3-reptiles, but 4-reptiles are too varied? So to sum up, one approach to mathematical questions proceeds something like this. We first find something interesting. This opens a question and we try to find other examples with similar properties. We can then start to say which examples are really the same and which are different in some deeper sense. The final stage is to try to classify all possible examples. This is often too large a task, as was the case here, so we find ways that the problem can be divided up. 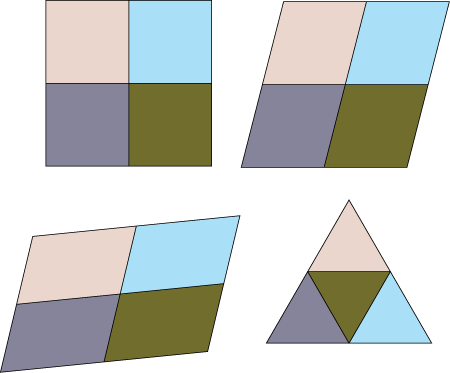 This division can be to consider a subset of the problem, for example to consider polyominoes rather than all tiles, or to slice the problem into smaller pieces, for example to consider 2-reptiles and 3-reptiles rather than all possible rep-tiles. 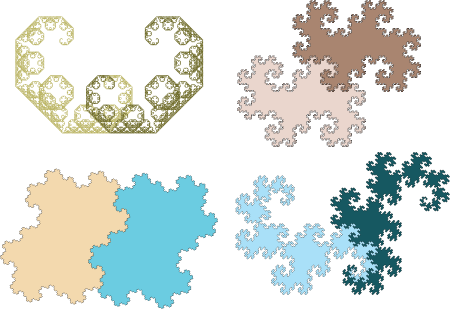 These partial results will often lead to new examples, and new ideas such as the change from polygons to fractal shapes. They may even show why the main problem is not possible to solve. To find out more about rep-tiles search on the web, there is lots to find, but it can be a little hard as for some reason the biologists dominate the google results. Some good places are listed below, along with a couple of excellent books that consider rep-tiles along with a lot more interesting mathematics. One final note, this is intended to be an accessible mathematics piece, but it can be easy when talking about my own subject to lapse into jargon without realising it. If you have found some parts that are not easy to follow or confusing, therefore, please let me know. Fascinating approach! Beautiful pictures as well. ways to categorize rep-tiles with holes. how can we categorize these? a very simple rep-tile with a hole of size 16 made of squares. similar to what is described in the article: 90 degree rotation required). right-angled triangles allow an 8 with a hole if reflections are allowed. equilateral triangles allow an 81 (takes a bit of thinking about! ).